A quiz to the Wee Boy. Because I want to have written a blog, but I'm too swamped to actually write anything, I present to you a funny thing that I copied from the Facebook status of a friend. The Wee Boy is hilarious and fun and charming and such good company. I don't know, Mommy. Why? Scratching your back. But I didn't scratch your back when you woke up, so you were not happy. But now I scratched your back, Mommy. And you're happy. Awwwwww, you're happy now. I made you happy. I don't know, Mommy. Babies crying? That makes you sad, mommy. When babies cry, that makes you sad. Ha ha ha ha, like that! I don't know. A baby? You were a baby. I don't know. How old are you? She pretends to be a starfish. You're not good at playing cars. Play cars with me right now. Mommy, I want to hide from you. Count to ten and then say, "Ready or not, here I come." Please stop asking me these questions. Can you find me now? I'm hiding. Mommy, go to the sunroom and say, 1, 2, 3, and then say, "Ready or not here I come. All right mommy? Mommy, do that. Mommy go in the sunroom and count right now. We sing. We don't cook. Sometimes we cook. 18. How are you and your mom the same? We both have blue eyes. Mommy, I'm going to hide from you again. Can you cover me with the pillow? The pillow that you're sitting on? Can you move and cover me with that pillow? Mommy, I said I don't know. Mommy, I'm finished with this game. I don't know. Maybe the movies. No more questions, please. No means no. A Pot of Tea and some funny things the Wee Boy has done. After an annoying bus-wait/bus-ride to the office (today: Safai formerly known as Java), I changed up my usual caffeine order to: a pot of English Breakfast tea (Scottish Breakfast not being an option). My mind immediately relaxed, remembering the ceremony of tea, the steepage, the patience, the aroma, the wee cups and sugar bowls and teensy weensy milk carafe. Instead, I got this -- surprisingly for someone who is used to tea in the United Kingdom, but every bit as soothing. Surrounded by terrariums, birdhouses, and succulents, I am now attempting to breath deeply (even though those breaths were just interrupted by watching THREE, I saw THREE buses pass by in three minutes ... back to breathing). 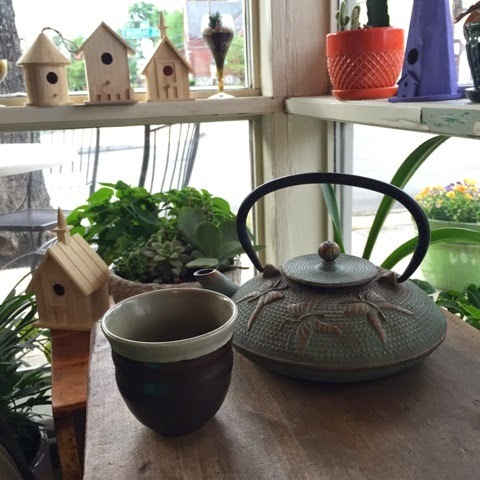 The Japanese style teapot seems a little anathema to my English Breakfast tea. There's no sugar bowl or milk pitcher, but it's still completely adorable. I didn't even mind when he woke me up three times -- twice to tell me his dreams and once to go to the potty. He is such a sweet, sweet boy. Anniversaries of weddings and albums and whinges and spastic mood shifts! Also, my most recent full-length album, West 28th Street, celebrated its SEVENTH anniversary yesterday. That means it's in the 2nd grade, is reading chapter books, and is already looking at colleges. I'm a little depressed by that number. Seriously though, every time I attempt to make a record, something ridiculous happens. Like, my drummer decides he's giving up music all together and "taking up surfing." (That is not a joke.) Or I finally get everyone together, and then the studio gets a last-minute-call-from-a-celebrity-with-a-trump-card and has to cancel. SEGUE TO I'M NOW SUDDENLY IN A GOOD MOOD because someone at Heine Brothers just recognized me for my music and asked me all about playing with Elvis Costello and then someone else asked me when my next album is coming out and so now I shall stop fussing with this silly blog and book studio time and maybe even find a non-insane-drummer who also happens to understand and vibe with my completely insane music. 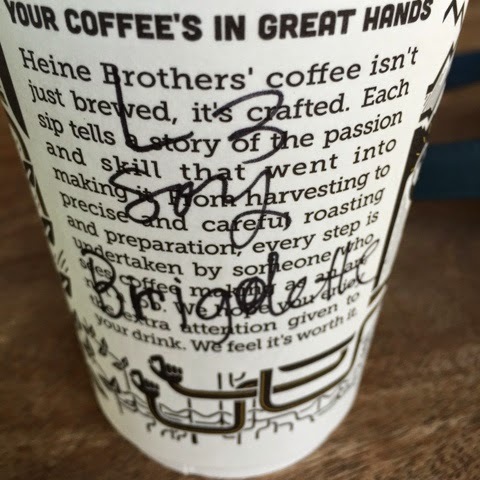 Here's a photo of yet another really crazy way to spell my name. Fresh20 Vegetarian review, Meal 3. Day 1 - Meal prep. 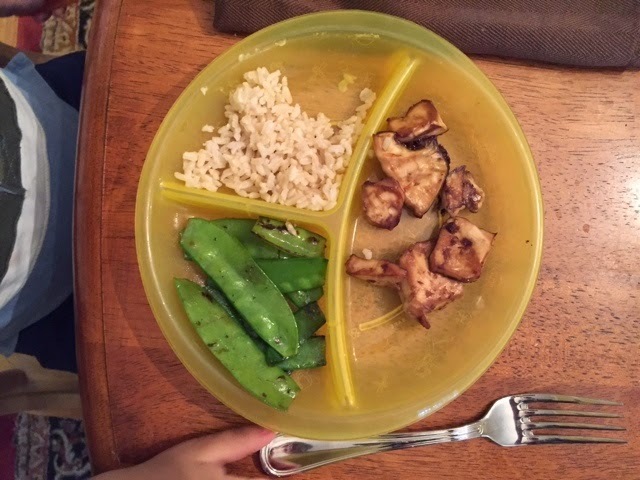 Then three of us (2 adults, 1 toddler) enjoyed the Ginger Tofu, Rice and Snap peas. Day 2 - Dinner at a restaurant -- not a total failure though because, come on, I have a restaurant problem. 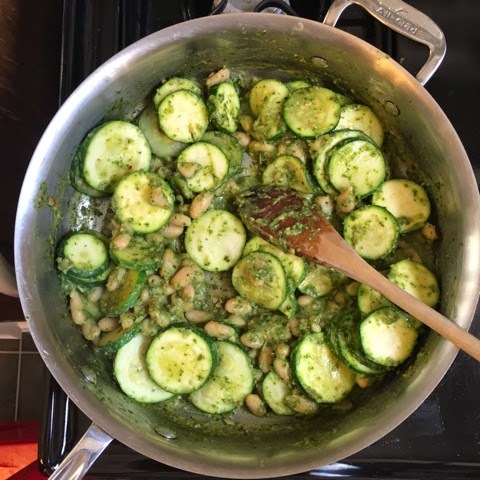 Day 3 - Invited neighbor over to eat Pesto zucchini with beans, broccoli, and roasted potatoes. We each had seconds. Day 4 - We are only on Meal 3 here, even though it's Thursday. This was the meal I was most skeptcial about: Asian Nachos. I am a nacho fiend, and I'm fiercly loyal to Tex Mex. In addition to my skepticism, we ended up having a surprise visit from my pal Colleen (The Meal Plannning Queen) and her 5 and 7 year old, AND we were babysitting a 3-year-old for a friend who needed a grownup evening. Colleen was a huge help in preparing the meal, advising me on whether I should substitute egg roll wraps for wonton wraps (your options are limited when you do all your grocery shopping the day after Derby) and whether the nachos should bake a few minutes more. It's much more fun for me to cook with a friend than to cook alone. The four kiddos all entertained each other by gathering every pillow in the house and putting it on the sofabed, while Colleen and I prepared our Asian Nachos. 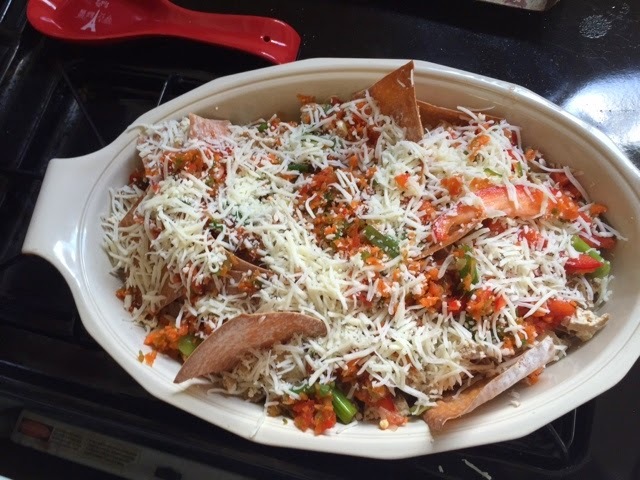 Asian Nachos were, to my huge surprise, a hit! They were delicious. Crumbled ginger tofu (left over from Meal 1) and various veggies that I had pre-chopped during the meal prep on Monday. 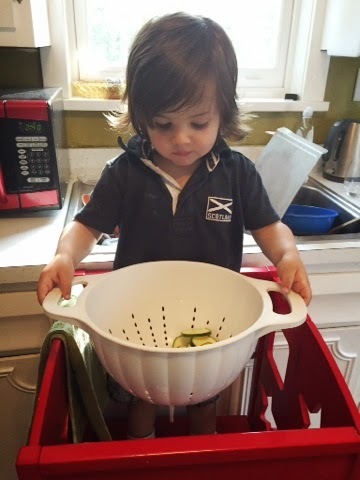 It was easy to prepare, and everyone liked it -- even the toddlers, though they didn't clean their plates. I have an adorable photo of all of us eating our meal around a dinner table, but I don't want to share it until I have permission from the other kiddos' parents. And it's morning and they are at work right now, so just imagine it instead. It was actually really pleasant -- no meltdowns. We even made up those funny stories where each of us told a line or two of a story, then went around the table adding to the story. It was kind of magical. We also had just enough leftovers for a good lunch on Friday, despite having served 2 adults and 4 children. Two meals to go: Friday night and Saturday night. 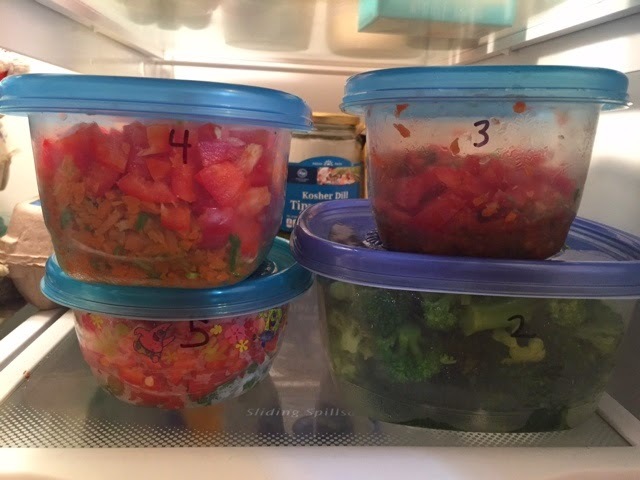 More Meal Planning review -- the Fresh20 vegetarian sample meal plantrial run. Day 2. Continuation of The Fresh 20 review! First, a correction: the grocery bill for last week's items was only $55. We bought $10 worth of c-r-a-p for a last-minute let's-have-movie-night-and-eat-unhealthful-foods, so the total receipt was $10. This only includes 5 meals and is supposed to feed 4 people. We are only 2.5 people, however, and my husband travels a lot. I invited people over to dinner every night last week to make my testing a little more scientific. If you remember, Monday morning I did an hour of food prep -- grating ginger, chopping vegetables, whipping up some pesto for later in the week. One thing I love about The Fresh 20, so far, is that it's mostly about whole foods. I'm not into packaged guacamole or pesto (I can always taste that same strange chemical-flavor). 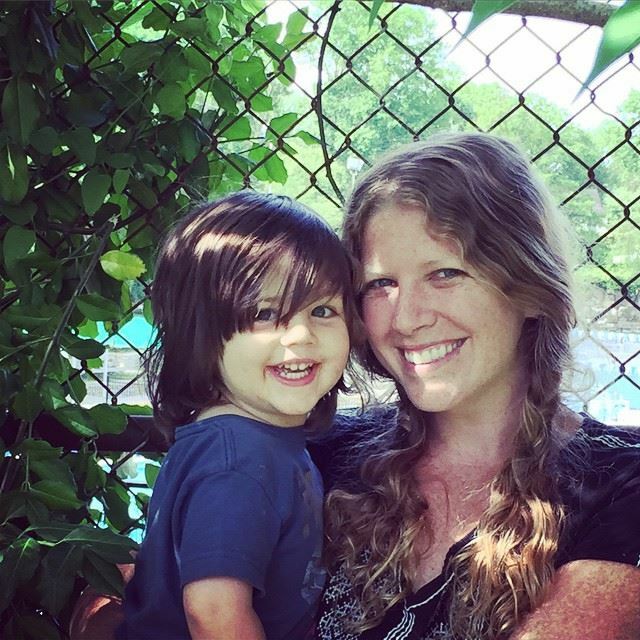 I also am primary caregivier to my 2-year-old, however, plus I own my own business, so it's not like I have a lot of time. Making the pesto for the week -- arugula, basil, and cashews -- was easy and took just a few minutes. It takes me longer to open a jar these days with my arthritic hands. Anyway, on Tuesday, I had Ginger Tofu, Snow peas, and Rice, for lunch -- left over from Monday's dinner. Tuesday evening was a fail on my part, however, as I met some friends for dinner. So much for the stay-in-and-cook goal. Still, Fresh20 only sends 5 meals a week, allowing for social events that happen unexpectedly, so I tried not to beat myself up about it. 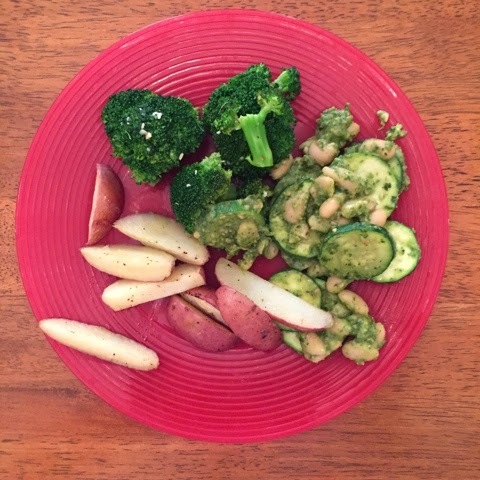 Wednesday's dinner was Pesto Zucchinni with Cannollini Beans, Broccoli and Roasted New Potatoes. I forgot to save half of the pesto for another recipe, so it was extra pesto-y (a good problem, believe me). It was completely delicious. The Wee Boy ate all of his, and both grownups had seconds. (David was out of town, but we had a friend over to recipe-taste.) So. Good. 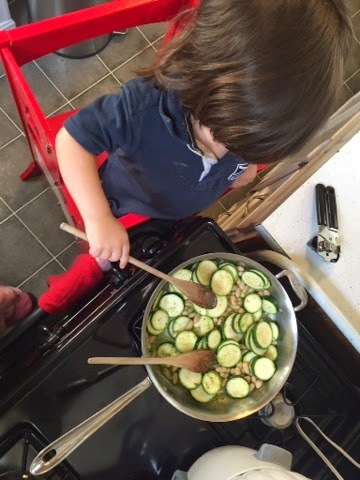 I think next time I will use the vegetable peeler to make zucchini noodles (or "zoodles" if you are super-annoying) instead of the rounds -- just a personal preference. The Wee Boy's plate. He ate it all. Enough for today. I'll tell you about Meal 3 tomorrow ... I'm a bit behind blogging, as usual, but I will say that I enjoyed last week's meal plan enough to attempt a different menu from the same company again. Review: The Fresh20 Meal Plan. My attempt at following a plan. 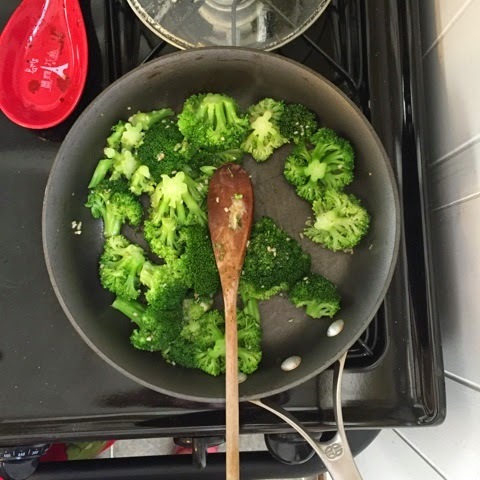 I am a working mother, and dinner comes as an utter surprise to me pretty much every day. I've tried getting friends to explain meal planning to me. They seem so smug, with their "Sunday prep day" and their freezer full of portion-controlled ziploc bags of meals. I just want someone to tell me when Taco Night is. I prefer to shop European style* -- i.e. pop down to the market every day or two -- for various reasons. I often have evening gigs or we eat at a restaurant, thus ruining any plans I might have had. I can't stand throwing food away, so better to buy small amounts at a time. Eating non-processed foods is not a new thing for our family, so it's not like we don't know how to cook. 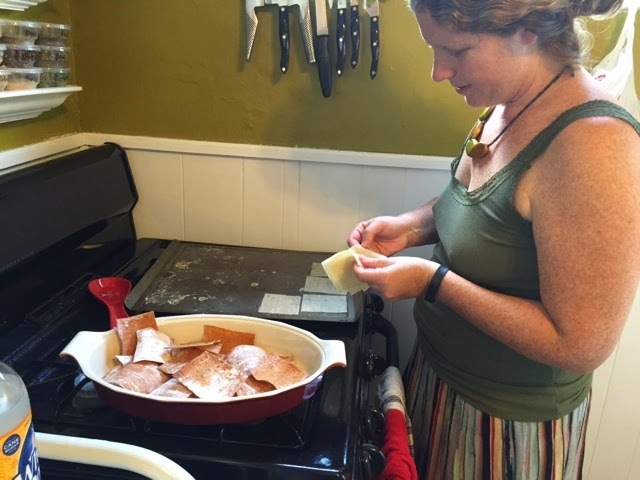 We've been making our own crackers and tortillas and pasta (not nearly as much since having the Wee Boy) for years now. We are also all vegetarian, so eating healthful foods is a hardly challenging. Still, the actual PLANNING part is somehow completely anathema to my carefree ways. Because we spent an ungodly amount of money last month on restaurants and because the idea of paying someone to meal plan for us is no longer an only-for-the-rich-folks thing, I'm going to try out several meal planning websites and report back to you. I've avoided them in the past partly because of cost, but also because I never liked the sample vegetarian plans I had seen in the past. I'm not big on fake meat. Even tofu, though I like tofu, is a little too processed for my over-thinking brain to handle. I do like tofu, I just didn't want a meal plan based around meat substitutes. We shall see what follows. First up in my review will be my week of following The Fresh20. Anyway, The Fresh20 weekly plan posts a menu of 5 meals, a shopping list, a prep-plan, the 5 recipes, and a nutrition guide (including serving size, calories, nutrients, etc). Sunday: We printed out the shopping list. Yes, there there is a SHOPPING LIST, which made our trip to the store quick and easy. Monday: I decided I would prep the first two meals. I ended up prepping all five meals because the prep for meals 3-5 only involved chopping vegetables. That seemed easy enough, and I was already on a roll. Ideally, in my hippie ways, I would have stored everything in glass containers, but I can't find any of the lids to my glass containers (who out there has the perfect lid-storage-system-that-doesn't-take-up-much-cabinet-room?). I went with the plastic, which means my photos don't look classy and we are storing our food in chemicals. Forgive me. I wrote a number on the side of the containers to tell me which meal it's for, in case I space. I used a permanent marker and decided I didn't care. David, the genius of the relationship, suggested that in the future I use Dry Erase markers. Duh. Monday night: We actually ate meal 1! It took about 30 minutes to cook, not including the prep. Those 30 minutes weren't actual work time though, as 25 minutes involved baking the tofu. Ginger Tofu, Snow Peas, Rice. I don't love that tofu was such a big ingredient, but I did love how it tasted. The Ginger sauce (homemade with actual grated ginger root) was delicious. All three of us cleaned our plates. There was one serving left over for lunch on Tuesday. I forgot to take a picture of my plate, which David artfully arranged. But here is the Wee Boy's dinner, minus a few snow peas and some rice. Tuesday night: I totally failed and went out to eat with a friend. Am horrible person, but will get back on track on Wednesday. The Fresh20 offers only 5 meals for the week because they recognize that families in our day and age go out to eat more often than we should. I guess I should accept that. *Yes, I know how pretentious that sounds, but what's a better word for it? My word-retrieval skills are failing since I became a parent. Royal Baby thoughts - my NHS birthing suite and yes, Kate looks fab. First off, let me acknowledge that I understand how absurd it is that I, a support of Scottish independence, am mildly obsessed with the Royal Family. I come to the Scottish Question as someone having lived in Edinburgh. I come to the Royal Family obsession as having grown up a girl in America who had a bizarre fascination with British history (I'm equally obsessed with Anne Boleyn as with Kate Middleton). Anyway: Yay! A princess was born. Everyone on the internet is all upset that Kate looked beautiful so soon after the delivery. We all know she had a team of stylists come in and do her hair and makeup. The fact that her wedding ring still fit, well, some women just stay thin -- or maybe it's a larger-size mockup or she had the ring enlarged. Who knows, who cares, she's The Duchess! People are also freaking out that she went home so soon after the birth. For a natural and simple delivery, there's nothing wrong with that. I lost a lot of blood, which was the only reason I stayed overnight. But still, the Wee Boy was born at noon, and I went home the next morning. Hospitals are icky, germy and not a place for newborns (unless medically necessary, obviously). Also, can I just comment on how wonderful and grand it is for all of womankind that midwives attended Kate? Our bodies are amazing. One article on ScaryMommy also claimed that "looks like she spent the day in a spa, and got a baby as a thank you gift." This made me laugh because, honestly, I don't think I've ever been in a spa that was as pleasant as the birthing suite where I had my little boy -- and my boy was born in an NHS Royal Infirmary, not a private wing of a hospital. Check out these photos of my birthing suite. If we were living properly in the future and had smellovision, you would be able to inhale the essential oils and understand how this room smelled like an Aveda spa. I'm not comparing birthing a baby to a day in the spa, just birthing a baby in a spa, I suppose. Look at that ginormous pool, the bean bags, the funny shaped foam pieces, the artwork, the kind doula knitting on the sofabed (yes, sofabed). Then imagine if this was my free NHS room, what does the Lindo wing look like? ?